"Ride and Rider as One 人马一体 (rén mǎ yì tǐ)"
The rider on a white horse, Pang De is a very capable military general that served under Ma Chao 马超 and his father, Ma Teng 马腾. After the death of Ma Teng, Pang De and Ma Chao resisted the attacks of Cao Cao 曹操 but were unable to hold on to their city of Han Zhong 汉中. Ma Chao fled to join Liu Bei 刘备 in Shu Han 蜀汉 while Pang De surrendered to Cao Wei 曹魏. Cao Cao thought highly of Pang De and gave him a high position in the military. However at the battle of Fan Cheng 樊城之战, Pang De's loyalty came into question. This was because his old partner Ma Chao and his elder brother were aiding the enemy in that very siege. To prove his loyalty, Pang De kow-towed to Cao Cao till his head bled and brought along his own coffin into battle to prove that he would rather die than return defeated. Pang De did not succeed and was executed by Guan Yu 关羽. Your distance calculated to other players is reduced by 1. Character ability 2: "Fearsome Advance 猛进 (měng jìn)"
Whenever your ATTACK 杀 is neutralized by a DODGE 闪 from the target player, you can discard a card from the target player. Pang De has always been known for his superb horsemanship and is even nicknamed the White Horse General for his white steed. Therefore "Horsemanship" is no surprise. "Fearsome Advance" on the other hand, does not seem to have any appreciable link to the story. It was said that Pang De always charges to the battlefield prior to anyone, thus coming the name “Fearsome Advance”. This ability, similar to Ma Chao’s “Iron Cavalry”, makes ATTACKs less dodgeable. How about Lubu and Pang de ?? 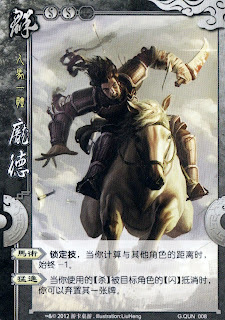 Lu Bu's ability requires that two DODGE cards must be played in order to be neutralised (抵消) - in other words the ATTACK will not be dodged until the second DODGE has been played. Thus, Pang De only activates his Fearsome Advance ability in this scenario, in which the target has played two ATTACKs in response to Lu Bu's Without Equal ability. Should the ATTACK be evaded, the target would lose a grand total of THREE oh-hand cards given that Pang De triggers his effect.